$125-$225 per night minimum 2 night booking. 3 different Cottages. The farm produces strawberries, raspberries, blueberries, asparagus, melons, greens, roots, a wide range of annual Mediterranean vegetables, as well as orchards of diverse varieties of peach, plum, apple, pear, quince, persimmon, fig, chestnut, and cherry. We also manage a small flock of laying hens, produce ten acres of grains and legumes, and have over 30 acres of hay and pasture. 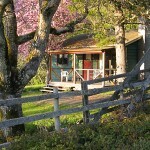 There are three unique accommodations on Foxglove Farm, which can be booked separately or together for groups. 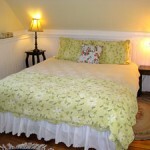 The green cottage is a classic country style guesthouse perfect for couples, friends, or small families. 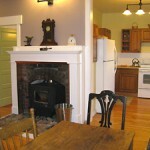 The cottage has one private bedroom, full bath with tub/shower, private deck, fully equipped kitchen, wood stove and a queen sleeper couch in the living room. The cottage sleeps 4 people (rate is $150 a night based on double occupancy, additional guests are $25 per person per night). There is a 2 night minimum. 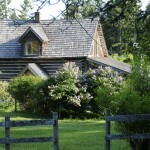 The log house is a beautifully restored heritage farm house built in 1907. The house is uniquely appointed with traditional décor, down comforters, fine linens and full bathrooms with locally made soaps. The house has two private bedrooms: one with a queen bed and one with two twin beds. Two captain's beds (perfect for a child or smaller person) and a queen size futon are also in place to accommodate additional guests. The house sleeps 4 guests for the base price of $225. Additional guests can be accommodated up to a total of 6 guests. Extra guests are $25/night per person. There is a three night minimum on the log house. The red cabin is a small studio cabin with a double bed in the loft, and two single beds in the lower main area. 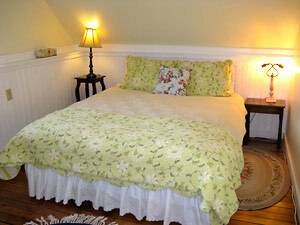 The cabin is appointed with charming decor, down comforters, and fine linens. This unit is a budget accommodation with a shared kitchen and bathroom. A very cozy step up from camping, the cabin is perfect for a couple or single individual, or it can be reserved along with the log house or green cottage, also on the property, as an additional private sleeping accommodation. The nightly rate for the red cabin is $125 per night based on double occupancy with an extra guest $25 per night (sleeps up to three adults + one child). A two night minimum is required. 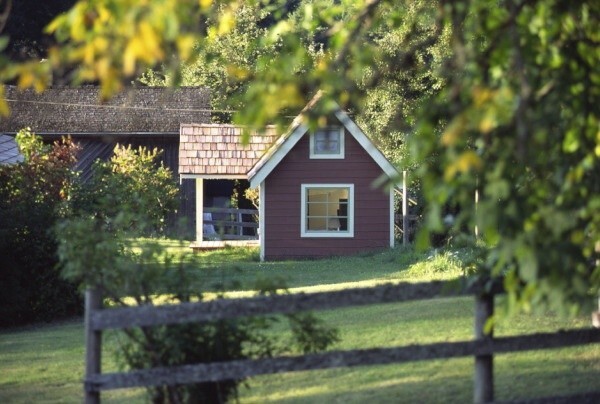 Foxglove Farm is family-friendly and children of all ages are welcome. 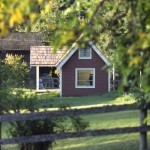 The farm is also pet-friendly, a one time pet charge of $40 applies.